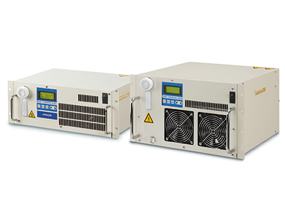 The rack mounted option from SMC is a refrigerant-free temperature control device mountable in a 19-inch rack. Rack mounting recovers desktop or floor space, permitting stacking of related devices and mobility, depending on the rack style. Air cooling frees the installation from dependence on facility cooling water. This model achieves high precision regulation of recirculating coolant using an air-cooled peltier element. Floor type rackmount is also available, whereby the brackets and handles are removed and rubber feet are mounted instead. Allowing for benchtop applications. To further discuss the range of chillers available, and how we can help you to find the perfect solution to keep your process under control. Please contact us, or request a callback at a convenient time to suit you.